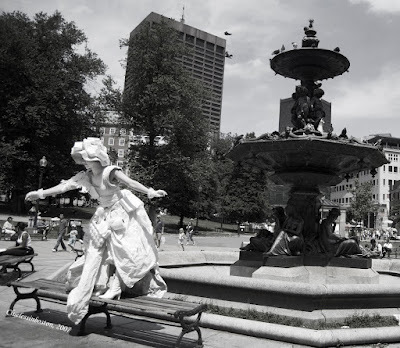 A mime, wearing a costume made entirely of recycled objects performed on Boston Common. Her costume was very cleverly done and her "donation" basket was an old portable tv set. She wrote notes on sheets of toilet paper for those who left donations. Note the toilet paper roll hanging off her belt, next to the egg carton.